The Cottage is positioned further along the creek and is stylishly built and furnished. Fully self contained with one private room and an inner spring pull out sofa in the lounge, the Cottage sleeps 2 people. This is a perfect getaway for honeymoon couples, couples with small families. We can sleep extra people but check with owner . The Round House is fully self contained and has a 360 degree view of the rainforest and spring fed creek. It sleeps up to 4 people. The Japanese loft and the Rainforest view room both have queen beds. This beautiful pole home has been stylishly built from timber and glass. It's simplicty perfectly harmonises with it's natural surroundings. We can sleep extra people but check with owner directly. 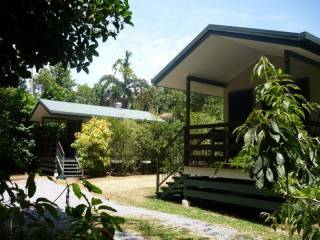 Nestled away in the tranquil World Heratige listed Daintree Rainforest along side your own private crystal clear creek, you will be surprised to find such a wonderful getaway. 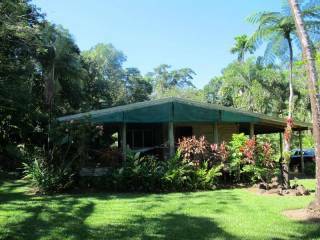 Daintree Cascades is two beautiful fully self contained houses for you to choose for your perfect retreat. the creek provides hydro electricity for this self sufficient property. Be prepared to get lost in these beautiful surroundings... Watch the crystal clear water cascading past your door while listening to the wildlife enjoying mother nature at her finest. your retreat to the Daintree Cascades is the perfect way to completely relax from the hustle and bustle of everyday life. The Round House is fully self contained and has a 360 degree view of the rainforest and spring fed creek. It sleeps up to 4 people. The Japanese loft and the Rainforest view room both have queen beds. This beautiful pole home has been stylishly built from timber and glass. It's simplicty perfectly harmonises with it's natural surroundings. We can sleep extra people but check with owner directly. You’ll fall in love with the view from anywhere in this Daintree accommodation. From the dining room table you can hear the water flowing over rocks in the stream, you can see the waterfall through the trees, and the coolness of the water spray. The rainforest is littered with wildlife, and we are lucky that our patch of rainforest is home to 6 endangered species of native trees. While you’re cooking dinner you’ll be treated to a view of the water dragons sunning themselves on the rocks, and dragonflies frolicking around the water’s edge. If you’re a bird lover you will love that we have many kingfishers that use the creek as a flight path, and often sit at the water’s edge catching insects. Their brilliant blue plumage shimmers in between the trees. The Round House is ideal for small families where the parents want some separation from the kids, and couples planning a relaxing weekend away in the Daintree. Of course, if there’s just the two of you then you will love the extra room that The Round House provides, or you might like The Cottage too. The Cottage is positioned further along the creek and is stylishly built and furnished. Fully self contained with one private room and a inner spring pull out sofa in the lounge, the Cottage sleeps 2 people. This is a perfect getaway for honeymoon couples, couples with small families. Firstly and most importantly we have no grid electricity here so we make our own, this is achieved by harnessing the water coming down the creek we do this by piping water from up high in the creek way above the main waterfall. The water travels down to our micro hydroelectric system and water pressure spins a water wheel, this in turn creates an electric current. Please keep clear of this unit as it has moving parts. We then charge a big set of batteries which then powers both the Roundhouse and the Cottage, so just like your mobile phone they require recharging too. This is why we ask if you are not using lights, fans or the TV please turn them off so the batteries can have time to charge up again. On that note please limit the use of any power consuming gadgets i.e. phones, laptops, I pads etc. and please no hairdryers or rice cookers. Please feel free to call us if you have any questions on how to use items within the property such as the gas oven and television. We ask if you are staying in the Roundhouse to use the access to the creek that is the pathway leading down when looking down at the creek, this area and upstream is for your enjoyment. If you are staying in the Cottage your access in down the pathway you can see looking toward the creek this is your private area. Please be advised that you enter the creek at you own risk we hold no responsibility if you hurt yourself. Be very careful walking on the rocks as they can be very slippery at times, so a good way to move through the property is to bend down and use your hands as much as your feet. There is a lot of wildlife that will come and visit. Cassowary’s (a large flightless bird), Pademelons (a small wallaby), Hippyspossms (small kangaroo species), Tree Kangaroos, Water Dragons, Boyd Forest Dragons (lizards), Mellomies (small marsupials), Bandicoot’s plus beautiful butterflies and forest kingfishers to name but a few. Be aware the Mellomies love to come inside at night and say hello so keep the doors closed and keep your food inside either the refrigerator or the pantry as they may stay for dinner. There is a telephone provided for local calls only so if you would like to book any tours please use the phone provided. Let the tour operator know you are from Daintree cascades and receive special treatment. The full amount for your stay will be deducted from the mastercard or visa credit card nominated by the guest. The transaction will occur within 48 hours of the booking being made. Directions from cairns are as follows. 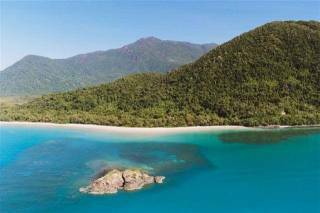 We recommend to hire a private vehicle as there is no public transport once you reach the Daintree Rainforest. Head North from the airport along Captain Cook Highway. Mossman or Port Douglas is a perfect place to stop for any supplies you may need during your stay. This is important as there is only a small local store for basics and fuel. Once across the Daintree River continue over the Alexandra range and keep heading north for around 15kms. Head along Turpentine Rd until the road forks and turn left onto Stonewood Rd.